Labor Day is a U.S. federal holiday observed on the first Monday in September. It became a federal holiday in 1894 to celebrate workers and their achievements. It has also become the “unofficial”end of summer as by this time schools have reopened and most summer vacations have ended. Also by this time the days (in the northern hemisphere) are starting to get shorter as we get closer to the autumnal equinox. As all fifty states observe the holiday, state and local government offices are closed as well. Banks are closed as are the U.S. financial markets. Most people who work in office jobs get the day off but retail stores do not observe the holiday usually offering special “Labor Day Sales” to draw customers in. 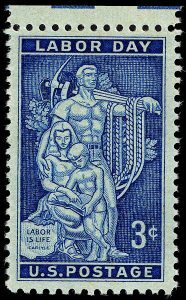 Today, 1 September, is Labor Day in the United States. It is a day specifically set aside to recognize the achievements of workers, to recognize their importance in the economy, and to thank them for the well being of this country. A similar day is celebrated in Canada on the same day. Labor Day became a national holiday in 1894 and occurs on the first Monday in September. As it is a federal holiday, the federal government is on holiday and there is no postal delivery. Banks are closed as well as the stock market. Every state and territory follows suit as well. Usually schools reopen around this date. When I was a kid, they generally started just before Labor Day but back then there was a second holiday in California on 9 September-California Admission Day. So we got two holidays back then in September! However there is no legal requirement anymore to observe it. No state agency closes for the date but local governments may choose to do so. Some school districts observe it but not always on the standard date. Los Angeles school district celebrates it on the last Friday in August. None of the public schools where I live observe the holiday. Aside from being considered the end of summer, a day for retail sales and ball games, it was also the last day you could wear seersucker or white suits. After Labor Day, wearing such clothing was considered a fashion faux pas in certain circles. You might get away with tan but it would depend on the formality of the occasion your attending. Have a pleasant day everyone. Labor Day is a national holiday in the United States and became a federal holiday in 1894. The holiday was created to celebrate the “the strength and spirit de corps of the trade and labor organizations.” Usually a parade occurs followed by a get together where people celebrate workers and their families. Aside from that, it is also marks the end of summer with schools now open and summer vacations at an end. Of course retail businesses like to use the day as an important sale day. For many though it is a nice long weekend.